" One of the best DVD Media we ever tested! Even far superior than any Ritek or Verbatim Discs. Best both in reliability and longevity. Work best on data, movie, music, photo or games. Suitable for master copy. " Taiyo Yuden is a global manufacturer of high-tech products including electronic components and recordable optical media. The company was founded in 1950 in Tokyo, Japan. Taiyo Yuden achieved worldwide recognition in 1988 with the introduction of the first recordable CD-R discs. They are renowned for the high quality and unique color of their Cyanine and Super Cyanine dyes used in disc production. 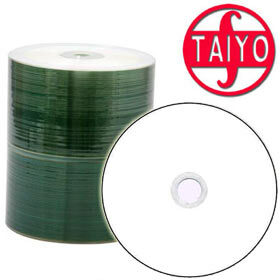 The recordable CD and DVD discs made by Taiyo Yuden are regarded as some of the best available in the world. Their strict manufacturing standards, high quality dye material, and low defect rate make them ideal for long-term data storage and archiving. Taiyo Yuden brand media is often used by recording and multimedia engineers and professionals. The price is typically higher than competing discs, however the quality is far superior. Area A & B – England, Wales and parts of Scotland, excluding Highlands and Islands. Area C – The Highlands and Islands of Scotland. 1. Postal charges are more for Area C and Area D is due to additional surcharge by UK-mail. 2. We only charge one delivery per order. The more you buy , the more you save! 3. We no longer offer free delivery due to the rising cost of postage. 4. Please select the right amount of delivery charge outside UK-mainland or your order will be cancelled. We do not ship any DVD/CD cases outside UK-mainland. 5. Due to our low flat delivery charges, we only allow 4 boxes ( or 400 pieces ) of DVD/CD cases per order. This is to limit the amount of damage/breakage during delivery. For international delivery, weight restriction applies (no more than 30 Kgs).